An as-yet-unidentified problem that cropped up over the past weekend continues to plague BioWare's Dragon Age: Origins content servers, leaving gamers unable to access their downloadable content. If you've been having trouble accessing your Dragon Age: Origins DLC over the past few days, don't fret because it's affecting everybody and BioWare is aware of the problem. Then again, maybe you should fret, because being aware of the problem doesn't appear to be doing a whole lot of good. "Over the April 9, 2011 weekend, some of our Dragon Age: Origins content servers experienced an as yet unidentified failure. 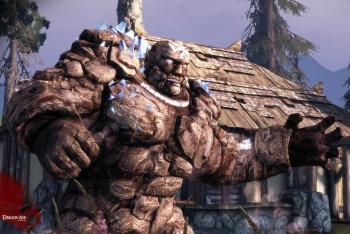 As a result, users began to experience error messages when attempting to access their downloadable content, indicating that the DLC was unauthorized," BioWare's Rob Bartel wrote on April 11 on the BioWare Social Network. "We apologize for the inconvenience and are currently investigating and working to resolve the issue on our end. We will update this thread once we know more." An update to the message was posted earlier this evening, but the news wasn't good: "We're continuing to investigate, both here and at EA," Bartel added. "We have some theories about what is occurring but no firm fix at this time." Commenters in the 45-pages-and-growing thread on the topic are less than pleased, which is hardly a surprise given that the problem apparently first surfaced sometime during the night of April 8 and yet there's still no solution in sight. Many users, including Jon Stokes at Ars Technica, have sunk substantial amounts of time into futile troubleshooting before learning that the problem was entirely unrelated to their installations, primarily because, as Stokes explained, "DLC authorization issues have plagued DA:O users from the game's launch, so Google will point you to plenty of threads in various forums that describe in painstaking, mind-numbing, encyclopedic detail the many different hacks and tweaks that users have invented for solving this peculiar family of closely related DLC problems." Even more frustrating for many of them is that prior to Bartel's post yesterday, neither BioWare nor EA made any public announcement about the problem, leaving gamers struggling to figure things out for themselves. The most obvious, and most reasonable, way to avoid this sort of fiasco in the future is to simply do away with online DRM entirely and a few optimists have expressed hope that EA will do just that in future releases like Mass Effect 3. I think that's a great idea, but I'm sure not going to hold my breath. In the meantime, we'll keep an eye on the situation and let you know when things are resolved. UPDATE: Things are now resolved. BioWare's Fernando Melo posted a lengthy and detailed explanation of what went wrong and why it took so long to get it fixed, but the short version is that it was a bit of a perfect storm: BioWare's attention and that of the volunteer forum staff over the weekend was on Dragon Age 2 forum threads due to an upcoming patch, while the initial reports of the problem that began coming in on Friday night appeared identical to a different, known DRM issue that affects a much smaller number of users and thus didn't raise any red flags. It wasn't until Monday's catch-up on forum activity that anyone realized something much more serious was going on. Logging out and reconnecting should fix everything up; Melo said anyone still experiencing problems is "99 percent likely" to be suffering from the previous, known issue. A patch to address that problem is in the works and in the meantime, links to other solutions are provided in the thread.